If you’ve read this little corner of the web for the last little while, you may remember when I discovered a love for baseball. Since that post nearly one year ago, I’ve discovered so many things about the game of baseball. The major discovery, and arguably the most important one, is that baseball is full of players who are giving of themselves and of their time and talents when it comes to charitable events and causes. In April of this year, I came across the Miracle League, an organization that establishes baseball leagues for children with disabilities to be able to enjoy the game of baseball at their own pace and in an environment that is wholly accessible to them in every way, shape, and form that could be imaginable. More on that soon. There’s a good story. Happy Mother’s Day – Pink Bats and all! This is a copy of a BLOG I posted last year on Mother’s Day ~ it’s still relevant. Hope you enjoy it! 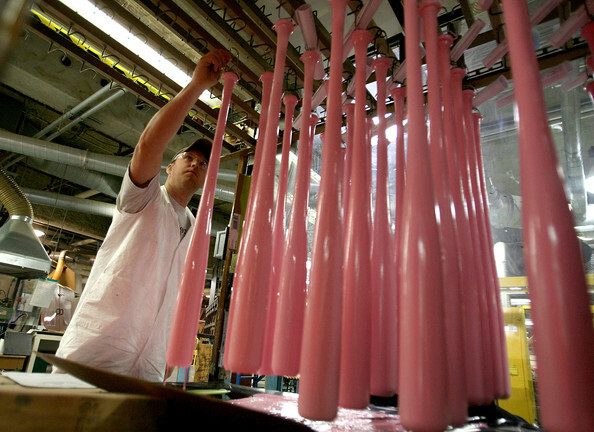 ‘PINK BATS A PERFORMANCE ENHANCER? YOU DECIDE! Thank you Guillermo Quiroz ….. It’s Why We Love the Game. Baseball’s unlike any other sport. It’s the only one I know that’s not given time restraints. A one-half inning lasts as long as it takes to get three outs. It could last for only three pitches, or it could go on for hours, or seem like it. Take the fifth inning in last night’s game between the Dodgers and Giants. The Giants lead 5-0 at the beginning of the 5th, and then it all fell apart as the Dodgers scored seven runs, one after the other, on and on and on. I thought it would never end, but finally it did and by the end of the 9th inning the score was tied 9-9, and we were in overtime ~ extra innings. It’s a fluke that third string back-up catcher Guillermo Quiroz was even on the roster last night. Hector Sanchez is the regular back-up catcher for Buster Posey and had been sent back to the Minors only the day before. So when Quiroz steps up to the plate I’m thinking what the heck’s going on. I mean doesn’t Bochy know it’s the 10th inning? I was already a little perturbed with Boche after leaving Vogey in to get really hammered in the fifth ~ he should have taken him out earlier. So when Guillermo steps up to the plate I turned up the volume and went to the kitchen to do the dishes. What happened next happens all the time in baseball. In fact, it happened the night before with Buster Posey and was no big deal. Well, it was a big deal, but we’ve gotten a little spoiled with Buster so you rather expect this sort of thing from him. And it isn’t even that Guillermo Quiroz really smacked the hell out of that first pitch for the game-winning home run. It was what happened after, as he looked out at that ball flying towards infinity, and you knew that he knew it was gone. No doubt in his mind. And when his arms went up in the air and he started towards first base he had a huge smile on his face, yelling something that made you realize that “spirit of victory” that we’ve all heard about so often is more than just a saying …..it’s why we love the game. And we really loved the game tonight. And to be honest, I was smiling and yelling right along with him. The dishes could wait.